Horse-drawn carriages are available for hire between the town and the Serra. It is well worth trying this means of transport, for a most agreeable trip under shady trees to the "glorious paradise" of which Lord Byron spoke. 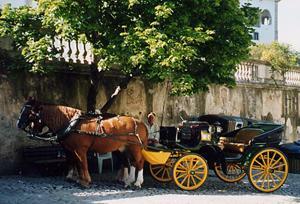 The carriages start from and return to the large square in front of the National Palace of Sintra.